Located between Canterbury and Ashford, join us at our ancient woodland camp on the beautiful Kent Downs for this introductory 1 day bushcraft course. We’ve put together this 1 day bushcraft course for people whose time is precious but would like to gain a thorough grounding in the key skills of bushcraft and survival. So we’ve created a package that will ensure that you leave us with simple, repeatable bushcraft and survival skills that’ll give you the confidence to broaden your horizons in the great outdoors. Had a great day, thanks to all the team. The food and location were perfect had a very informative day learning outdoor skills. Thanks Gary and Nicola for an inspiring day. The one day course is a good starting point to get familiar with the basics of bushcrafting and survival skills. Gary covered lot of ground and planned it well so we could try different knife and fire lighting skills ourselves as well as wander around to collect wood. Lunch was delicious, thanks to Nicola and her wild garlic sauce is a must. 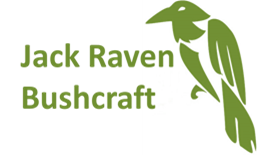 Highly recommend Jack Raven courses. Very skilled and inspiring group!